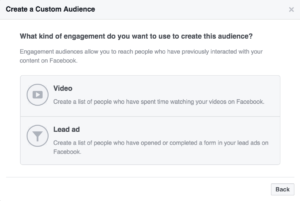 TLDNR: Facebook's new engagement custom audiences now enable you to target users who have previously engaged with your Facebook content (starting with videos and lead ads), which can zero in on active vs passive users. Facebook is becoming something of an advertising savant these days. With revenues growing 59% and profit tripling YoY, the ad network is launching product after product in the advertising space to keep growth climbing. Coming on the heels of updates including average cost bidding and event-optimized app install campaigns, Facebook now brings advertisers content engagement audiences. That's on top of an incredible innovation track record that includes 13 unique objective campaigns and the fascinating Canvas ad unit. Creating a custom audience in Facebook is one of the best ways for marketers to target the right Facebook users with ads and are focused on enabling you to target users who have engaged with your brand in some way (the ubiquitous remarketing ad) or targeting people who share characteristics with your current customer base and are therefore likely to become customers, too (Facebook's earlier game changer lookalike audience). Facebook already allows you to target users who like your page and their friends, or optimize ads for users most likely to engage with an ad, but these new campaigns provide a unique additional value, by allowing marketers to target users who have interacted with specific content bits of on Facebook. This may on its face seem redundant vs targeting people who like your page or even lookalikes, but Facebook engagement campaigns expand your ability to target people who have engaged with your brand, but have not gone so far as to like it. Think of all the people who have commented on, shared or liked your content but still don't follow you. Furthermore, by overlapping audiences, you can refine your targeting even more to improve the ROI of existing targeting methods like general website visitors or lookalikes by only targeting engaged users, rather than just casual visitors or correlations (which may or may not be based on actions; the details of how lookalikes audiences are built are unknown). By improving the effectiveness of Lead Ads, Facebook can pull in more businesses skeptical of paying for email leads by giving them additional (targeting) value above and beyond just an email address. And by allowing advertisers to target users who have interacted with a video, Facebook boosts the value businesses gain from putting their video content on Facebook, which follows other improvements in video management and bolsters Facebook's move to become the ultimate king of content by drawing more content and video ad dollars away from Youtube. One potential downside is based on the danger of paying more per impression for users who often take basic actions such as watching a video or entering an email address in, but rarely take a priority action such as purchasing. How well will these new engagement ads actually perform? When will they roll out to Instagram? 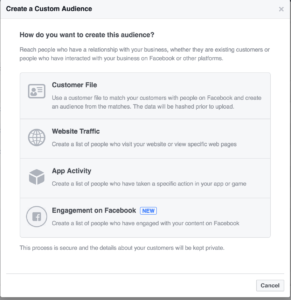 What other types of content will Facebook allow marketers to target based on? What other moves does Facebook have in store? Will Facebook at some point begin winnowing its campaign objectives to focus on top revenue generators? Incipia is a mobile app development and marketing agency that builds and markets apps for companies with a development specialty in high-quality code architecture and keyword-based marketing optimizations. For blog/video or speaking requests, business or press inquiries please contact us at hello@incipia.co.